As the transfer market becomes increasingly efficient, clubs have moved to buying younger and younger players. The quest for transfer success has led to what is effectively an informational arms race between the top clubs, who have invested heavily in worldwide scouting operations and cutting-edge quantitative analysis teams, all in order to identify the best players in the world as early as possible and secure their transfer before anyone else comes knocking. And yet, sometimes it still doesn’t work out. There are many instances of a top club signing a very sought-after young prospect to great expectations from the media and fans, and then… he can’t establish himself in the first team, is possibly loaned to a club lower down the pecking order, and eventually transferred out without ever having had much of an impact. However, some of these players eventually go on to succeed at a level higher than the club who released them in the first place. Were we too rash in releasing young players with a lot of potential? Or have we just moved too early, when these players were still years away from their peak performance? This happened to Chelsea a few times. In the past decade, their efficient scouting operations enabled them to move first on Romelu Lukaku, Kevin De Bruyne and Mohamed Salah. It is impressive that Chelsea were able to identify so early players that are some of the best in the world today. Of course, the catch is that these players are enjoying great success today not at Chelsea, but at their biggest competitors. Take the example of Salah. After signing in 2014, he stayed at Chelsea for barely a year, playing less than 6 full matches, before being loaned out and then sold. In 2017, he came back to the Premier League with Liverpool, taking them to the Champions League final and scoring a record-breaking 32 Premier League goals. Chelsea would undeniably benefit from having Salah in their squad today. What happened? 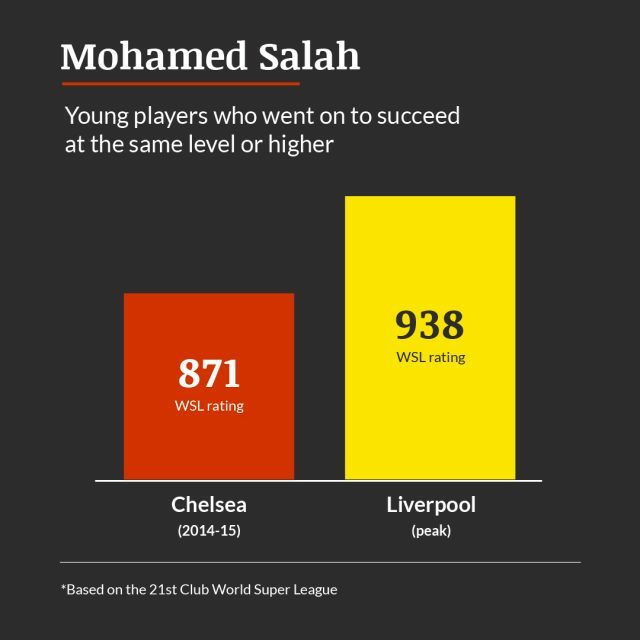 One explanation is that at 21, Salah wasn’t yet ready to make the step up from Basel to Chelsea. Our previous research has indicated that strikers tend to peak between 24 and 26, and obviously that will depend on the player. However, given that in his two full seasons in Serie A he scored 14 and 15 goals, it seems likely that he was good enough to contribute at Chelsea. The more likely explanation is that it is hard to keep young talent when they are not getting any game time. And this is the cautionary tale for us: when signing young players, it is important to ensure they will have a meaningful role within the squad and have a clear progression path to the first team. Lukaku, De Bruyne, Salah, and many others such as Paul Pogba at Manchester United and Philippe Coutinho at Inter left only once it became clear that there was no clear path forward for them. Luis Usier has created 8 entries. Is the smart money on Solskjaer?